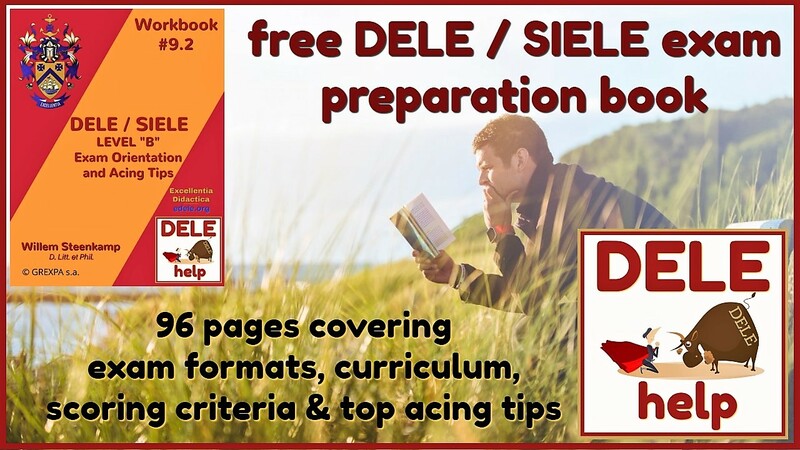 Welcome to our DELE exam tips blog. If you're new here, you may want to subscribe, using the convenient form in the right margin. Thanks for visiting! 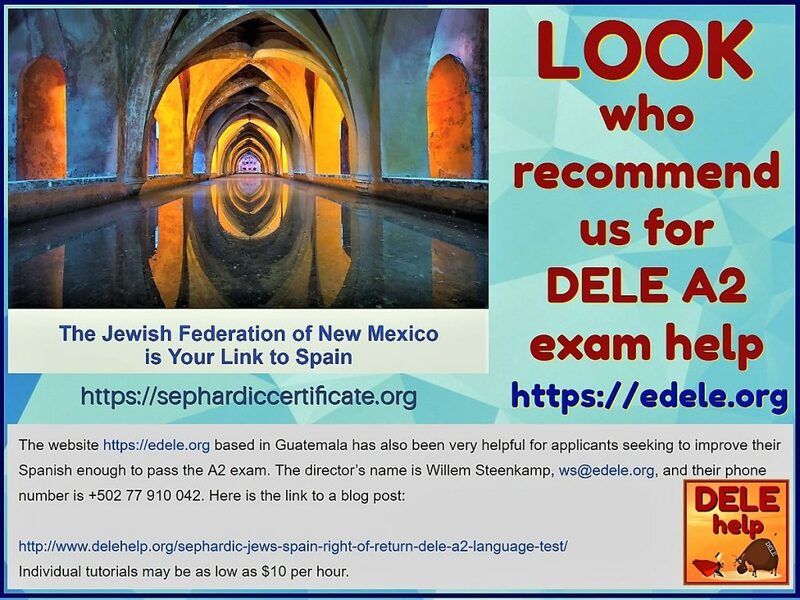 If you are of Sephardic descent and you are keen to apply for Spanish nationality, then you don’t have that much time left to meet the language test requirement – the DELE A2 exam. That said, there definitely still remains sufficient time to achieve this, even for beginners. The Spanish law of 2015 allows applicants a limited window to comply with its requirements. The deadline has already been extended once (and the law only allows for that one extension). It expires on 1 October 2019. It is theoretically possible that it may be extended again, but this would likely require amendments to the original law, not just a simple administrative act (as with the first extension). 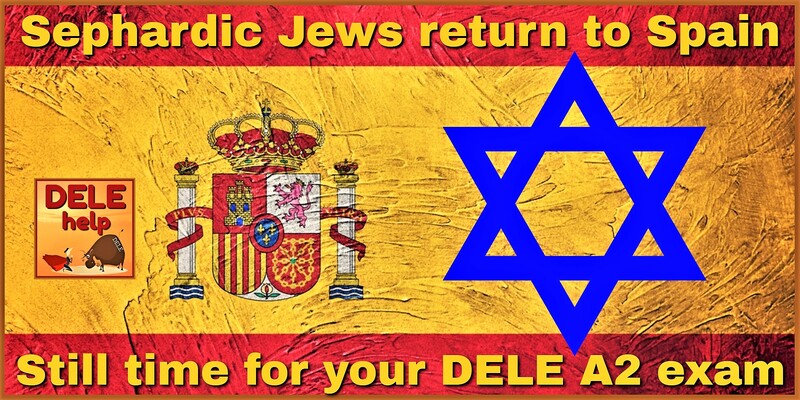 A complicating factor may be that the Muslim world is questioning the fact that, whilst in 1492 Jews and Moors were expelled from Spain, only descendants of those Sephardic Jews are currently being invited back in. One of the main requirements under the return law, is that applicants must show proof of having mastered basic Spanish. This is tested by means of the DELE A2 exam. The A2 is the second lowest level of Spanish in a system that goes up to C2. A2 is really “survival Spanish”, with elementary grammar and its vocabulary focused on the candidate’s immediate needs and for describing his/her close living environment. The DELE exams are offered world-wide, on a limited number of days per year. The dates for 2019 are shown below. A problem with the DELE is that the results typically only become available three months after the exam date. The actual diploma usually arrives a further three months later. The surest exam date to aim for Sefardis to aim for, would therefore be 8 February 2019. That way you can be reasonably certain to have everything formally in hand before the current (and likely final?) end of September 2019 deadline. You will notice that 8 February is a special exam just for Level A2. In February 2018 this was offered as well, and because only the A2 level was tested, the papers could be marked a lot quicker than having to do all of the normal six levels. Therefore the results of the February 2018 A2 exam actually were available in about 5 weeks. Hopefully it will be the same again this year. The digital results are typically published three months after the regular exam dates (i.e., those of April to November). These digital results are quite official and legal. One can probably assume that the authorities will accept these electronic results as basis to meet the end September deadline, while then waiting for the diplomas to arrive. It is a rather long bureaucratic process for the awarding of citizenship to be finalized (it seems the overall process takes about two years, with the end September deadline being for getting your application in, together with proof of meeting the requirements). Accordingly, we can assume that the 5 April and 25 May exam dates may still allow students sufficient time to present at least their electronic results (if not yet the printed and signed diploma) before the deadline. 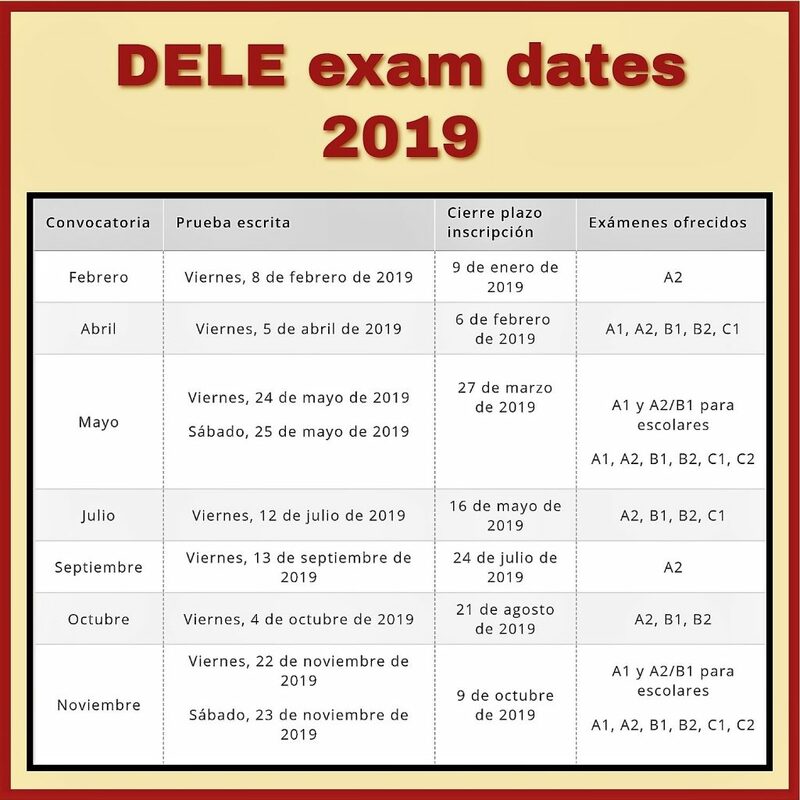 However, the 12th of July date will REALLY be cutting it fine, unless the Instituto Cervantes (who oversees the exam) puts in a special effort to process the July A2 level VERY fast. Please remember that registration for the exams close about four weeks prior to the exam date. For the February exam, you have until the 9th of January 2019 to register. Please make sure that the exam center that you aim to choose, will definitely be presenting the A2 on 8 February 2019. Not all centers present all of the exams offered in a given year. Also be sure to ask whether the particular center must first meet a quota of candidates before Madrid will send them examiners (for the oral; not all centers have locally-based qualified oral examiners always to hand). Students have had the unfortunate experience of registering at such centers, and then receiving an e-mail from them on the last day of registration saying: “sorry, we didn’t meet the quota so we won’t be offering your level after all”. This then leaves the student in the impossible situation that it is then too late to search for another center. A last point about the registration process: if you suffer any disability that may impact your ability to fairly complete the exam, such as being hard of hearing (which may be a problem if you have to listen to the audio of the listening comprehension test over a public sound system in a group context, rather than having earphones) you need to take this up with your center from day one. 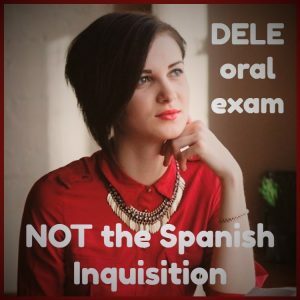 As far as the exam itself is concerned, it is NOT the Spanish Inquisition. It is not a “gotcha” type of exam trying to catch you out. It is a real-world, very practical test of your competency at communicating intelligibly in basic Spanish. The oral examiners are trained to try and put you at ease, and the exam papers as such are full of helpful guidance, so please don’t rush reading them – read them carefully, twice. The DELE is not like your typical school or college language exam. It is not hung up on grammar, or on marking you negatively for every small mistake. It is all about communication; about messaging: can you understand a simple message and are you able to convey an understandable message in turn? The four equally-weighted scoring criteria of the DELE are: coherence, fluency, ample vocabulary, and correctness (the latter encompassing pronunciation, spelling, and grammar ). The examiners are under orders to ignore “slip of the tongue” type grammar mistakes that don’t impact the clarity of your message. So, can a beginner start now and hope to pass the February exam? Definitely, YES. On condition, of course, that you are dedicated, apply yourself, and have access to a 1-on-1 tutor. That “personal trainer” must work with you i.t.o. a personalized study plan, based on first of all doing a proper diagnostic of your level, aptitude and learning preferences. BFA in Graphic Design. No qualifications in Spanish. When can we do a Skype interview about your needs? My schedule is currently very open. I’d love to get started as soon as possible. Which aspects of your Spanish do you need help with? 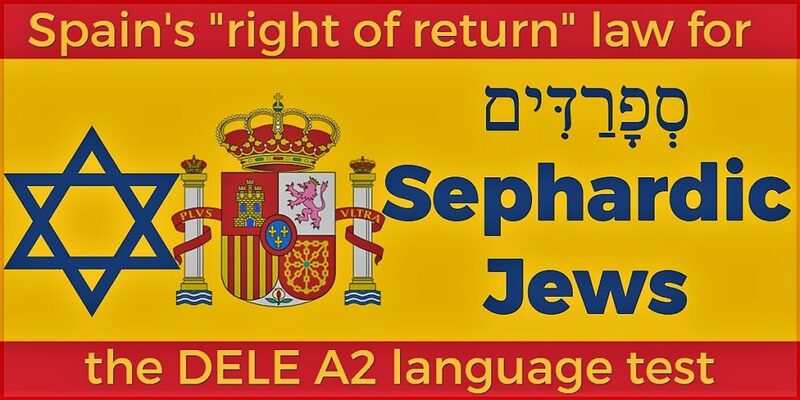 I’ll be taking the A2 exam for the Sephardic Jews Spain Right of Return. I’m scheduled to take the test on May 19, I’m not sure I’ll pass the first time, so I’m currently planning to take it again in July. Well, this student took 20.5 hours of very focused, structured classes with us via Skype, starting on 3 May, and on 19 May he passed! And he isn’t the only one to have achieved that kind of progress, by any means. I could cite a whole list of similar cases. YES, IT CAN BE DONE! (It is based on just such testimonies that the Jewish Federation of New Mexico kindly recommends us to Sefardis who want to seize this once-in-a-lifetime opportunity). At DELEhelp we go way beyond grammar, covering each of the four communicative competencies being tested in the DELE. We thoroughly familiarize you with the exam format and curriculum. We inform you about the four scoring criteria applied by examiners in evaluating you in the oral and writing tests. We also coach you in the “distractor” techniques used by examiners in the multiple choice reading and listening comprehension tests. Our tuition is hands-on, simulating exam reality. It is absolutely goal-driven (i.e., entirely focused on helping you to pass the exam). Above all our tuition is practical, informed by our own first-hand experience of the exam, from the perspective of an English-speaking student. It is an intensive, one-on-one effort to help you develop your actual communicative ability in Spanish, so that you can demonstrate the real-world skill sets that the DELE’s four equally-weighted scoring criteria evaluate. Our aim is to help you perform optimally in the exam setting. We help you to develop your actual communicative competencies. We DO NOT simply lecture you school-style about the “rules” of the Spanish language (which merely allows you to “know” in the abstract, instead of enabling you to actually DO). Your personalized study plan will provide for 2/3 self-study and 1/3 Skype interfacing with the tutor (i.e., for every hour of Skyping, we assume two hours of guided self-study). The Skype sessions serve to practice the things one cannot really do on one’s own at home, such as practicing for the very important oral expression part of the exam. The sessions also serve to give feed-back on the self-study assignments (for example, practicing writing in Spanish) and reviewing with you, your mock exam results. We include a lot of realistic simulated exam practice – using actual previous exam papers as well as model exams. Don’t forget to ask for our free, 96-page workbook of “DELE exam orientation an acing tips”, by simply filling in the contact info form linked to the image below (just click on it). We look forward to helping YOU ace your DELE A2 exam before the Sephardic window closes: “¡Si, se puede!” (Yes, it CAN be done! ).